Graeter's Mystery Ice Cream Flavor Revealed! Graeter’s Ice Cream has revealed their latest annual Mystery Flavor. The new Strawberry Cheesecake has been crafted after one of America’s favorite bakery items. 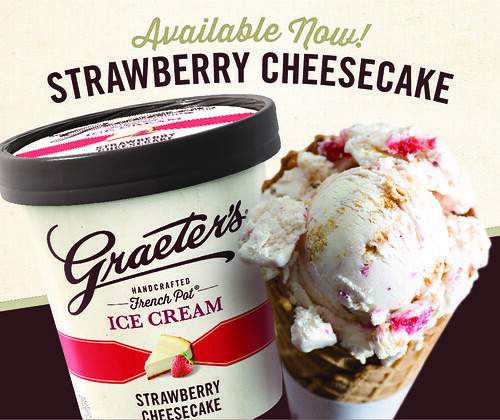 Graeter’s has taken its decadent cheesecake ice cream, added the finest strawberries and pieces of buttery graham cracker crust to delight true cheesecake lovers everywhere. The ice cream company, known for its indulgent, handcrafted flavors, rich chocolate chips and Old World French Pot process, invites consumers to visit a scoop shop or freezer aisle near them to try it for themselves. The Mystery Flavor is now available for purchase starting March 1, 2017. You can get a taste of their new Strawberry Cheesecake ice cream wherever Graeter’s Ice Cream scoop shops are located and in freezer aisles in most Giant Eagle, Kroger and Jewel-Osco stores, as well as other favorite retailers. Please visit Graeters.com to find a location near you. If you're in the Chicagoland area, Graeter’s Ice Cream, is excited to open the newest addition to its network of scoop shops in Winnetka at 940 Green Bay Road, across from Hubbard Woods Park. This location, the 2nd in the Chicagoland area, is set to celebrate its Grand Opening on March 10, 2017. The store will offer a complete menu of indulgent ice cream, with a portion of the proceeds from opening day benefiting the Winnetka Public Schools Foundation. A ribbon cutting celebrating the new scoop shop opening is planned for March 10, whereby area dignitaries and community members are invited to celebrate along with the Winnetka Public Schools Foundation and the Graeter family and other members of the Graeter’s team. This beloved ice cream becomes more accessible to already loyal area consumers who may currently visit the scoop shop in neighboring Northbrook. Available in pints in area grocery stores for the past few years, Graeter’s looks forward to now sharing a full menu of ice cream flavors, sundaes, milkshakes, old-fashioned sodas and candy. The address of the Winnetka location is 940 Green Bay Road, Winnetka, Illinois 60093. Spring hours of operation are 11 A.M. to 10 P.M. Sunday thru Thursday and 11 A.M. to 11 P.M. Friday and Saturday. Graeter’s Ice Cream produces craft ice cream using a French Pots, a small batch, artisanal method of production dating back over a century. Graeter’s has won the hearts of ice cream enthusiasts across the country as well as the respect of the nation’s most influential foodies. Famous for their signature chocolate chips, the Cincinnati-based company remains family owned and operated and continues to handcraft ice cream 2½ gallons at a time. Today, Graeter’s has more than 55 retail stores and ship over 300,000 pints annually for online mail order sales. Graeter’s can also be found in more than 6,000 grocery stores in 46 states. Visit www.graeters.com for more information.